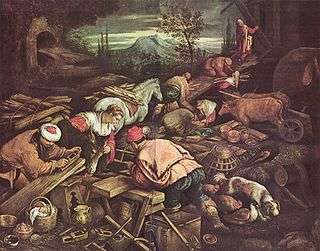 The Construction of Noah's Ark by Jacopo Bassano depicts all the eight people said to be on the ark, including the four wives. The Wives aboard Noah's Ark were part of the family that survived the Deluge in the biblical Genesis flood narrative. Although the Bible only notes the existence of these women, there are extra-Biblical mentions regarding them and their names. In Genesis 6:18, God says to Noah, "But I will establish my covenant with you, and you shall come into the ark, you, your sons, your wife, and your sons' wives with you" (ESV). 1 Peter 3:20 states that there were eight people on the Ark. The deuterocanonical Book of Tobit does not name any of the wives aboard Noah's Ark, but it does say that Noah's wife was one of his "own kindred" (Tobit 4:12). According to the Sibylline Oracles the wives of Shem, Ham and Japheth enjoyed fantastically long lifespans, living for centuries, while speaking prophecy to each generation they saw come and go. According to the preface of the Oracles, the Sibyl author was a daughter-in-law of Noah: the "Babylonian Sibyl", Sambethe — who, 900 years after the Deluge, allegedly moved to Greece and began writing the Oracles. The writings attributed to her (at the end of Book III) also hint at possible names of her family who would have lived before the Flood — father Gnostos, mother Circe; elsewhere (in book V) she calls Isis her sister. Other early sources similarly name one of the Sibyls as Sabba (see Sibyl in Jewish Encyclopedia). The early Christian writer St. Hippolytus (d. 235 AD) recounted a tradition of their names according to the Syriac Targum that is similar to Jubilees, although apparently switching the names of Shem's and Ham's wives. He wrote: "The names of the wives of the sons of Noah are these: the name of the wife of Sem, Nahalath Mahnuk; and the name of the wife of Cham, Zedkat Nabu; and the name of the wife of Japheth, Arathka". He also recounts a quaint legend concerning the wife of Ham: God having instructed Noah to destroy the first person who announced that the deluge was beginning, Ham's wife at that moment was baking bread, when water suddenly rushed forth from the oven, destroying the bread. When she exclaimed then that the deluge was commencing, God suddenly cancels his former command lest Noah destroy his own daughter-in-law who was to be saved. An early Arabic work known as Kitab al-Magall or the Book of Rolls (part of Clementine literature), the Syriac Book of the Cave of Treasures (c. 350), and Patriarch Eutychius of Alexandria (c. 930) all agree in naming Noah's wife as "Haykêl, the daughter of Namûs (or Namousa), the daughter of Enoch, the brother of Methuselah"; the first of these sources elsewhere calls Haikal "the daughter of Mashamos, son of Enoch", while stating that Shem's wife is called "Leah, daughter of Nasih". Furthermore, the Panarion of Epiphanius (c. 375) names Noah's wife as Barthenos, while the c. 5th-century Ge'ez work Conflict of Adam and Eve with Satan calls Noah's wife "Haikal, the daughter of Abaraz, of the daughters of the sons of Enos" — whom some authors have connected with Epiphanius' Barthenos (i.e., Bath-Enos, daughter of Enos). However, Jubilees makes "Betenos" the name of Noah's mother. The word haykal is Syriac for "temple" or "church"; in the Georgian copy of Cave of Treasures, we find instead the name T'ajar, which is the Georgian word for the same. Armenian tradition give the name of Noah's wife as Nemzar, Noyemzar or Noyanzar. Patriarch Eutychius of Alexandria, writing in Arabic, also states that Shem's wife was Salit, Ham's Nahlat and Japheth's Arisisah, all daughters of Methuselah. The theologian John Gill (1697–1771) wrote in his Exposition of the Bible of this tradition "that the name of Shem's wife was Zalbeth, or, as other copies, Zalith or Salit; that the name of Ham's Nahalath; and of Japheth's Aresisia." A manuscript of the 8th-century Latin work Inventiones Nominum, copies of which have been found at the Abbey of St. Gall in Switzerland, and in a library at Albi, SW France, lists as Noah's wife Set, as Shem's wife Nora, as Ham's wife Sare, and as Japeth's wife Serac. The Genesis Rabba midrash lists Naamah, the daughter of Lamech and sister of Tubal-Cain, as the wife of Noah, as does the 11th-century Jewish commentator Rashi in his commentary on Genesis 4:22. In the medieval midrash Parry, J. H. (ed.). "5:15". Book of Jasher. Translated by Moses, Samuel. , the name of Noah's wife is said to be Naamah, daughter of Enoch. The Persian historian Muhammad ibn Jarir al-Tabari (c. 915) recounts that Japheth's wife was Arbasisah, daughter of Marazil, son of al-Darmasil, son of Mehujael, son of Enoch, son of Cain; that Ham's wife was Naḥlab, daughter of Marib, another son of al-Darmasil; and that Shem's wife was Ṣalib, daughter of Batawil, another son of Mehujael. He says Noah's wife was Amzurah, daughter of Barakil, another son of Mehujael. Irish folklore is rich in traditions and legends regarding the three sons and their wives. Here the wives are usually named Olla, Olliva, and Ollivani (or variations thereof), names possibly derived from the Anglo-Saxon Codex Junius (c. 700 AD), a Bible paraphrase written in the fashion of Germanic sagas, and often attributed to the poet Cædmon. The wife of Noah is given as Percoba in Codex Junius. The Anglo-Saxon "Solomon and Saturn" dialogue gives for Noah's wife Dalila, for Ham's, Jaitarecta, and for Japheth's Catafluvia, while giving Olla, Ollina and Ollibana as alternatives. The name of Shem's wife is missing. Some versions of the Gaelic Lebor Gabala also name Shem's, Ham's and Japheth's wives as Cata Rechta, Cata Flauia and Cata Chasta respectively. Similar traditions seem to have endured for several centuries in some form, for in Petrus Comestor, we read that the wives of Noah, Shem, Ham and Japheth are Phuarpara, Pharphia, Cataflua and Fliva respectively, and in a 15th-century Middle English catechism, we find written "What hicht Noes wyf?" "Dalida; and the wif of Sem, Cateslinna; and the wif of Cam, Laterecta; and the wif of Japheth, Aurca. And other 3 names, Ollia, Olina, and Olybana." Ælfric of Eynsham's Anglo-Saxon translation of the Heptateuch (c. 1000) included illustrations with the wives' names recorded in the captions. One such illustration (fol. 17) names Noah's wife as Phiapphara, Shem's as Parsia, Ham's as Cataphua, and Japheth's as Fura. Another (fol. 14) includes one wife, presumably Noah's, named Sphiarphara. A Middle English illustrated version of Genesis dating to the 13th century also gives Puarphara as Noah's wife. Mandaean literature, of uncertain antiquity, refers to Noah's wife by the name Nuraita (or Nhuraitha, Anhuraita, various other spellings). Gnostic literature of the first few centuries AD calls Noah's wife Norea, including texts ascribed to her, as reported by Epiphanius, and confirmed in modern times with the discovery of these texts at Nag Hammadi. Hungarian folklore has several tales about Japheth and his wife called Eneh, attributing this information to the Chronicles of Sigilbert, Bishop of Antioch in the 14th-century Képes Krónika. According to the 15th-century monk Annio da Viterbo, the Hellenistic Babylonian writer Berossus had stated that the sons' wives were Pandora, Noela, and Noegla, and that Noah's wife was Tytea. However, Annio's manuscript is widely regarded today as having been a forgery. Nonetheless, later writers made use of this "information", sometimes even combining it with other traditions. The Portuguese friar Gaspar Rodriguez de S. Bernardino wrote in Itinerario da India por terra ate a ilha de Chypre in 1842 that the wives of Noah, Shem, Ham and Japheth were named Tytea or Phuarphara, Pandora or Parphia, Noela or Cataflua, and Noegla, Eliua or Arca. In Robert Southey's Common-place Book from around the same time, similar names are given, with the information attributed to the "Comte de Mora Toledo": Titea Magna; Pandora; Noala or Cataflua; and Noegla, Funda or Afia, respectively. A kabalistic work that appeared in 1670, known as Comte de Gabalis, considered sacred in Rosicrucianism, maintains that the name of Noah's wife was Vesta. This name for Noah's wife had earlier been found in Pedro Sarmiento de Gamboa's History of the Incas (c. 1550), where the names Prusia or Persia, Cataflua and Funda are also given for Shem, Ham, and Japheth's wives respectively. The Holy Tablets, first appearing in 1996 as the sacred text of the Nuwaubian Nation (which has fewer than 500 adherents) names Noah's wives as Naama, Waala, and Mubiyna, of whom only Naama survives the flood in the Ark. The corresponding wives of Shem, Ham and Japheth are named as Faatin, Haliyma and Ifat, respectively. ↑ These were considered to be the Sibylline Books of the Greeks and Romans by Athenagoras of Athens, quoting them in a letter to the Roman Emperor Marcus Aurelius in 176 AD, but modern critics believe they are rather pseudo-Oracles dating from the middle of the 2nd century BC at the earliest to the 5th century AD, composed by Alexandrian Jews and revised and enriched by later Christian editors, all adding texts in the interests of their respective religions. ↑ "The Ante-Nicene Fathers: Translations of the Writings of the Fathers Down to A". Christian Literature Company. 1 January 1886 – via Google Books. ↑ A strange book of poetry published in 1889 by American Charles Phifer called Annals of the Earth p. 286, in its voluminous appendix of mythographic notes, has the following statement, albeit without clear attributation: "Persian Magi hold that the first waters of the flood gushed out of the oven of an old woman named Zola Cufa." Water gushing forth from an oven (tannur) at the commencement of the Deluge, as mentioned in the Quran (11:40), is also held to be the signal for Noah in the 14th-century Stories of the Prophets by Ibn Kathir. ↑ Smith, Sir William; Wace, Henry (1 January 1877). "A Dictionary of Christian Biography, Literature, Sects and Doctrines: Being a Continuation of "The Dictionary of the Bible".". J. Murray – via Google Books. ↑ Ri, Su-Min (1 January 2000). "Commentaire de la Caverne Des Trésors: Étude Sur L'histoire Du Texte Et de Ses Sources". Peeters Publishers – via Google Books. ↑ "Journal of Theological Studies". Macmillan. 1 January 1903 – via Google Books. ↑ Parry, J. H. (ed.). "5:15". Book of Jasher. Translated by Moses, Samuel. ↑ Wright, Thomas (1 January 1845). "The Archaeological Album: Or, Museum of National Antiquities". Chapman and Hall – via Google Books. ↑ Wiener, Leo (1 January 1920). "Contributions Toward a History of Arabico-Gothic Culture". Neale publishing Company – via Google Books.